What an amazing achievement and an emotional journey for the four challengers, Richard Waterfield, Stephen Thrower, Danny Boore and Liam Hollands not only did they climb Kilimanjaro a once-in-a-lifetime experience, leaving them with long lasting memories they raised a staggering £15,350.00. After completing the challenge they had a day trip to the Nairobi National Park and also to The David Sheldrick Wildlife Trust. Here they were introduced to the baby elephant fostering programme, so through Megan’s Challenge we have adopted two baby elephants and gifted one to Gayton Primary School and the other to Gayton Goslings. Many, many thanks for all the help, support and sponsor’s who without them this challenge would not of been achieved. Megan’s Challenge is excited to announce that on Thursday 29th Sept 2016 a team of challengers Stephen Thrower, Danny Boore, Richard Waterfield and Liam Hollands are travelling to Kenya to climb Mount Kilimanjaro. Liam’s Dad, Warrant Office Justin Hollands who is attached to the British Consulate Nairobi, kindly organised this trip that has taken two years to organise. are hoping to conquer the Mighty Mount Kilimanjaro. This is what the team will be taking on!! 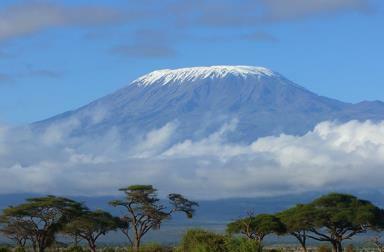 • Kilimanjaro is a Stratovolcano with three volcano cones, 2 extinct and 1 dormant. • Kilimanjaro supports five ecosystems: savannah bush land, sub-montane agro-forest, montane forest belt, subalpine moorland and alpine bogs, and the alpine desert. Although a final route (there are up to 8 to choose from) and date have not yet been finalised our research indicates that most trips last a total of 10-11 days (including flights to and from Kilimanjaro), of which 6-8 days are spent “trekking on Kilimanjaro. As an average, on a 7-day route we will trekking for 5-6 hours per day with the exception of “Summit Day” which is a mighty 12-14 hours! Obviously this will be upon challenging terrain and environment not to mention issues with Altitude. 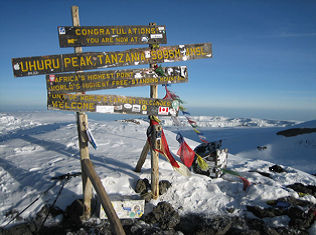 At the summit of Kilimanjaro there is 50% less oxygen than can be found at sea-level! As a result not everybody makes it to the top due to altitude sickness. The aim for this trip is to raise as much money as possible for Megan’s Challenge. The money raised will enable Megan’s Challenge to donate or sponsor without having to wait to do a challenge each time. Also it enables us to cover some of the costs of doing our challenges eg transport, fuel and advertising in addition to any sponsorship we may receive. Any additional costs eg accommodation is always paid for by the challengers not the charity. This means that all the monies raised from the challenges goes to the chosen charity/charities.